Two Dog Kennel blocks needed a fresh coat of paint on the insides as the blocks were rather tired looking. A few weeks prior, a volunteer crew from a local bank painted the outside of the blocks. Each year the SPCA rescue, rehabilitate and re-home thousands of lost, sick, injured, abused and abandoned animals. 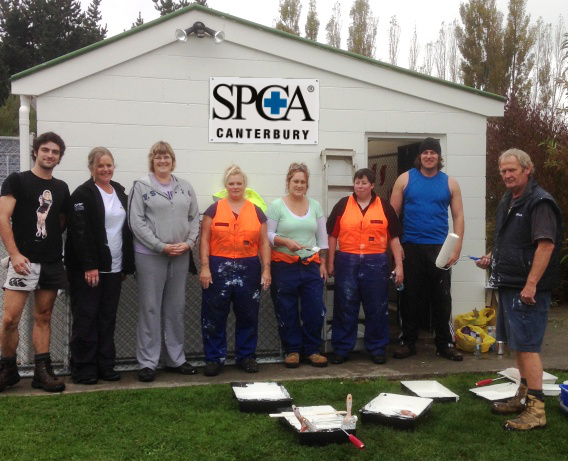 SPCA Canterbury is not government funded and relies on the generosity of the community to meet these needs by way of donations, sponsorship and bequests. The cost of operating this service is in excess of $2 million annually. Our appreciation goes to Adrian at� Dulux and Gary at Selleys for providing the supplies needed to make this happen for the SPCA. Thanks to all that helped with this project, we are sure the dogs will love their brighter fresher pens! The crew from L to R: Chris Lawrence, Fiona Williams, Bronwyn McCormick, Tracey Beecroft, Linda Duffy, Rochelle Chapman, Glenn Haami and Brian Elliffe.